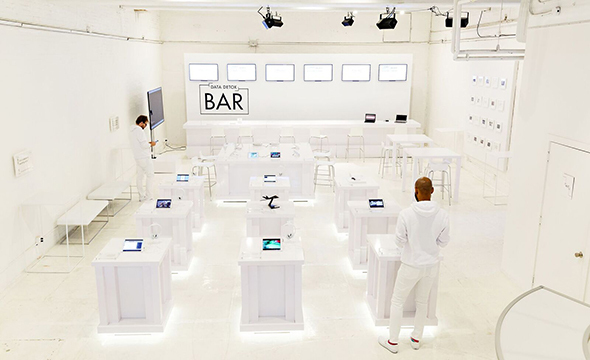 The Glass Room is an animated space in the form of a pop-up tech store that offers constructive and creative ways to explore our relationship with technology and how it’s changing our lives. Through artworks, speculative projects, interactive videos, animations and investigative and activist projects, The Glass Room puts big data on display in ways that make it more tangible and less abstract. Some of the projects invite visitors to visualise what lies behind the devices, websites and apps they use everyday: such as the Unfit Bits (Tega Brain and Surya Mattu, NYC) that provides fitness spoofing techniques to qualify your insurance rewards. Or Where the F*** Was I? (James Bridle, UK/Greece), a book filled with the 35,801 locations the artist visited between June 2010 and April 2011, the time period when Apple stored the location data of everybody who owned an iPhone. Others play with the manipulation of data collection, such as Ashley Madison Angels Working in London (!Medienngruppe Bitnik, Berlin/Zurich), a collection of avatars based on the hundreds of bots that were revealed to be seducing the men using the dating site when it was hacked in 2015. Or the newly commissioned MegaPixels (Adam Harvey, Berlin), an interactive piece where visitors can get a thermal print out of their celebrity doppelgänger, based on facial recognition databases. The Glass Room is a playful yet sobering insight into our relationship with technology presented by Mozilla, the makers of Firefox browser, and curated by Stephanie Hankey and Marek Tuszynski from Tactical Technology Collective, a Berlin-based non-profit working at the intersection of tech, activism and politics. In December 2016, The Glass Room temporarily occupied a storefront in New York, where it received over 10,000 visitors. The idea for The Glass Room was conceived and produced in the context of Nervous Systems – Quantified Life and the Social Question, an exhibition at theHaus der Kulturen der Weltin Berlin, in collaboration with Tactical Tech, co-curated by Stephanie Hankey, Marek Tuszynski and Anselm Franke. Full list of contributing artists and artist groups: Surya Mattu, Tega Brain, James Bridle, Manuel Beltrán, Aram Bartholl, Adam Harvey, !Mediengruppe Bitnik, Sam Lavigne, Wesley Goatley, La Loma, Tactical Tech, Joana Moll, Klaas Diersman, Ingrid Burrington and The Critical Engineering Working Group (Julian Oliver, Danja Vasiliev and Bengt Sjölén).